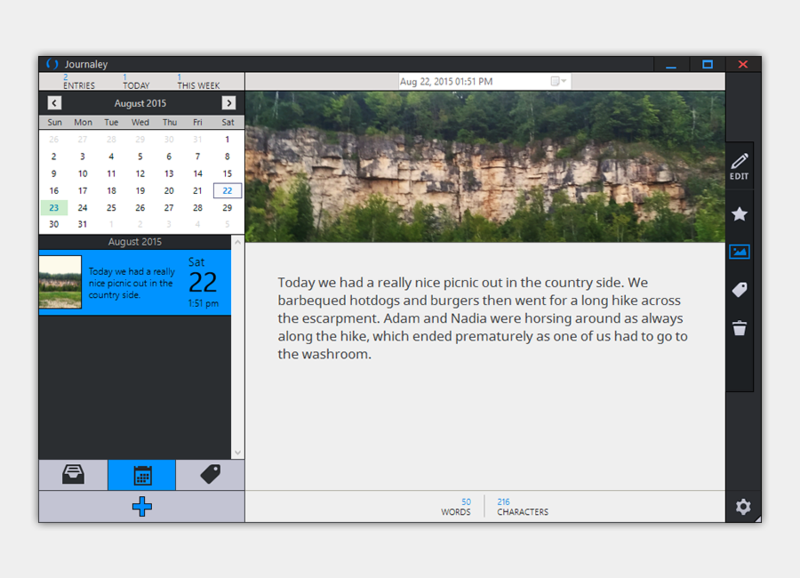 Journaley - A Simple and Elegant Windows Journaling Application. 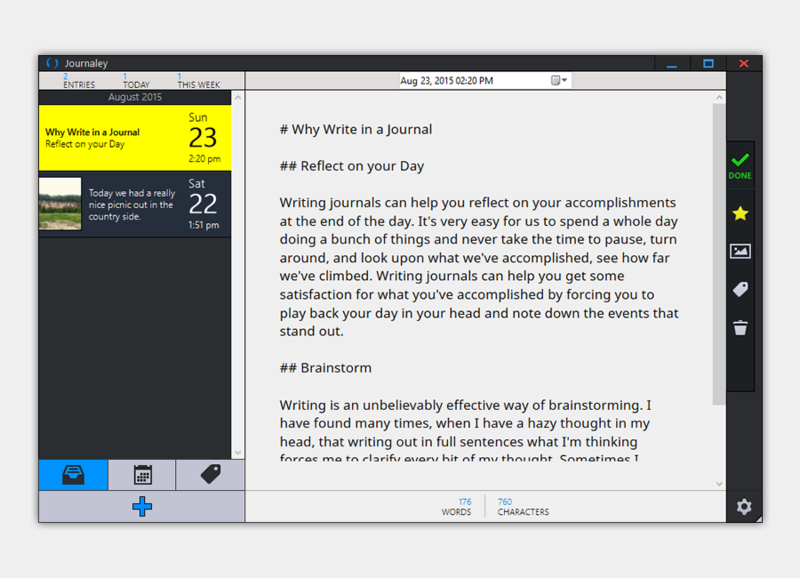 Journaley A simple and elegant journaling application for Windows. Journaley is available for free. developed and designed to let you journal. It was built with care for Windows. 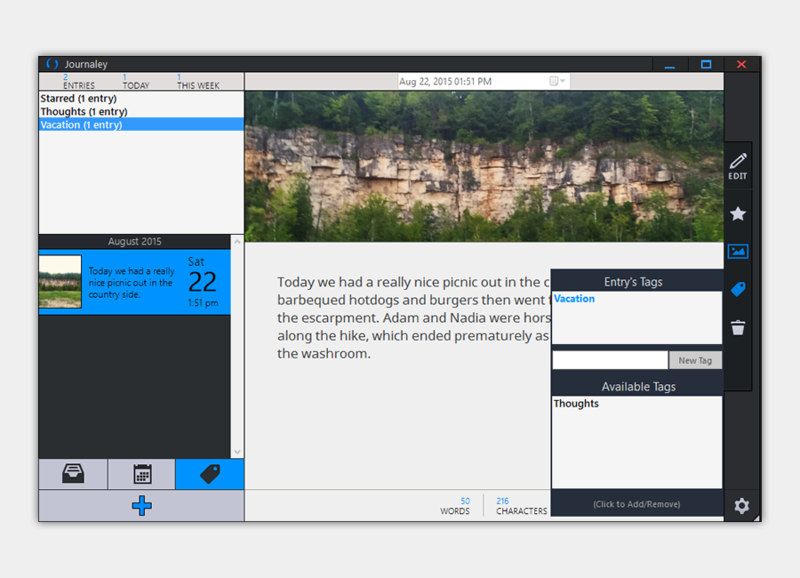 Journaley supports Markdown and favoriting entries. The writing environment is designed to mimic the confined feeling of writing in a notebook. With your tools on the right and the list of entries on your left, keeping the area where you write in the middle was intentional to add some sense of constraint, which is important in a journal. The writing area itself has whitespace to allow for comfortable writing and the background is not pure white as to not strain the eyes since we expect journal writing to occur day and night.Your writing is automatically saved after a few seconds of inactivity so you never have to worry about saving. Journaley also checks for updates to the entry made outside of the app in real time, for example if your journals are synced through Dropbox and you make changes to the entry using Day One app, you'll see the changes instantly in Journaley. Journaley supports one image per entry. The image can be added through the clipboard or through the filebrowser. Adding an image to the entry is a core aspect of journaling. It's as simple as clicking on the image button in the tool bar to add an image. The image in the entry can quickly be expanded to fill the writing area through a simple click of the image in the entry. The image is also visible in the form of a thumbnail in the entry list in such a way that it takes enough space to be recognizable but leaves enough space for the date and entry text preview. It's also important to note that in the entry list, Journaley only displays the first sentence of your entry, rather than showing as much as possible and having to truncate it with the infamous ellipses all the time. 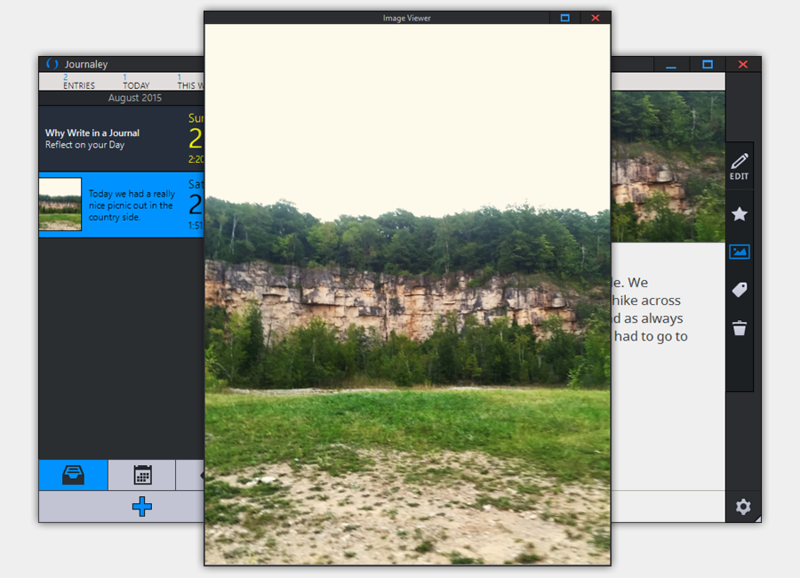 Journaley allows for seeing images at full resolution in a preview window. The image viewer window is designed to show the whole picture. It displays the image in a window with as little chrome as possible. The image is first displayed in a scaled version to be easily manageable in a window but clicking on the image displays it in full resolution in the window. The calendar was built to be useable in a very compact area. The today date is highlighted in green, the days with entries are blue and bold. To go back to today's date after navigating between months it's as simple as clicking on the month's title. An additional note about the calendar is that it's an easy way of creating an entry on a specific date by just selecting the date in the calendar and creating the entry with the "+" button. Journaley supports adding tags to entries. Tags are a way of organizing journal entries. For example if you go on vacation every year, tagging your entries related to vacation with the same tag you'll be able to go back and see all vacation related entries. The tags interface is fairly simple, where adding a new entry requires typing it, and adding old ones requires clicking on the Available Tags. The tags tab allows viewing all entries associated with each tag. 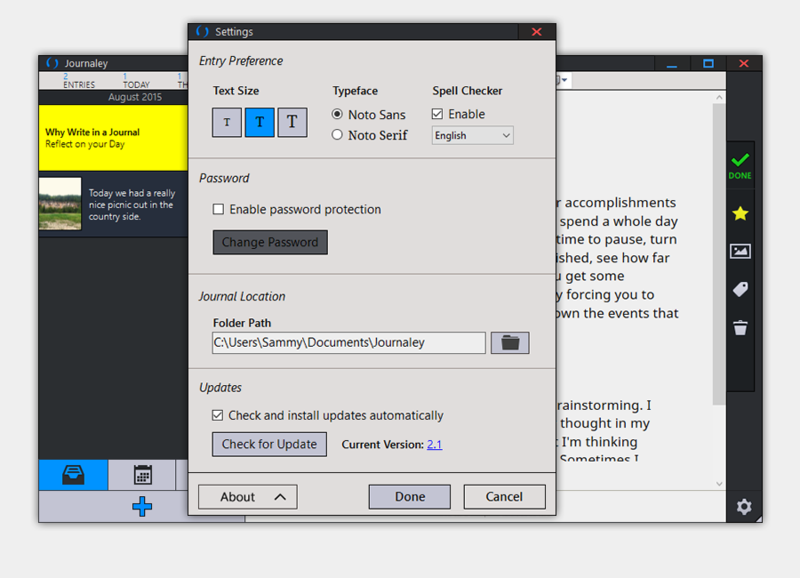 Journaley supports different text sizes, different typefaces, spellchecking, password protection, Day One journals and automatic updates. 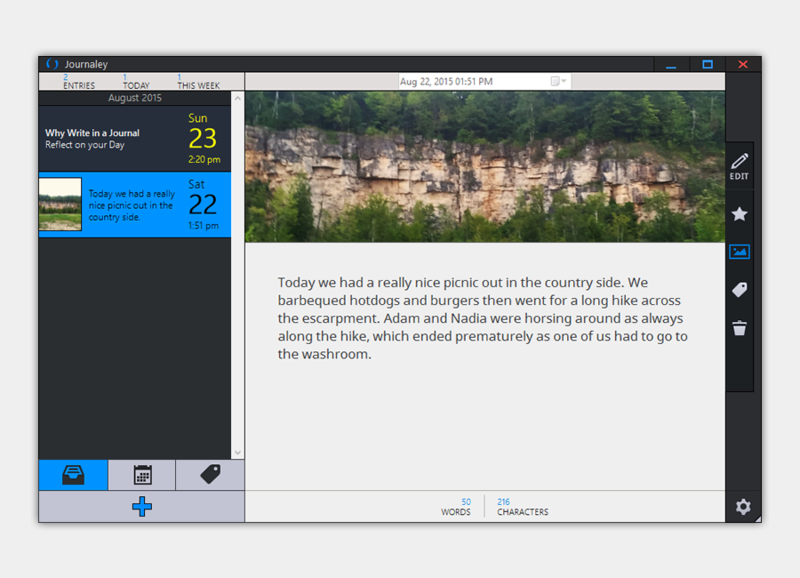 Journaley has some basic entry customization to accommodate different styles of journaling, the most important of which is spell checking. By default we leave spell checking enabled, but we see the argument for disabling it, where writing without worry should include not worrying about proper spelling and the red underlines that come with it. We left it enabled because spell checking is a basic expectation of writing applications, so we decided to make it an option. Password protection is another important feature in journaling. You can set your password, but it's important to note that if you forget your password, there is no way to recover it. It's also important to note that password protection doesn't encrypt your entries, so tampering is still technically possible. Password protection only adds a primitive layer of protection, if you are worried about your journal's privacy you should find alternative ways of adding sufficient protection. Journaley supports Day One journals which is automatically detected if located in your Dropbox folder in the welcome screen. If you wish to use Journaley to edit Day One entires you need to change the folder path to the folder that contains the "\entries\" folder (typically: Dropbox\Apps\Day One\Journal.dayone). Updates in Journaley are as invisible and silent as possible. You may notice that as soon as your run the .exe installer the app is fully installed in your system as soon as you see the first screen. The update procedure is very simple, and can be made even simpler if you check the "Check and install updates automatically" option, where updates are handled similarly to Chrome and occurs upon restarting the app, so you essentially never have to worry about updates. If you want to explicitly update Journaley you will never be bothered by a popup upon startup, you will only see a small indicator near the gear button that would indicate an update is available.